Tom 7 Radar: Defense scheduled! The reason that you haven't heard from me is that I'm still working on my dissertation. Even though it is kind of fun to push through these marathon efforts, the thing that makes me quite sad is that I don't get to spend hardly any time doing creative projects. So I am really looking forward to being done with this thing! Here's a chart. If you want to put dollar signs on one axis, be my guest, but the horizontal axis is time (each tick a day) and the vertical axis is words in my dissertation (not counting the proofs in the appendices). 50,000 words is what the NaNoWriMo people consider a novel, so I've already got two. Also notice the big flatlines from my trip to Philadelphia/France and the subsequent increase in speed. I should wrap everything up and hand it in sometime next week. The official version is currently 396 pages (about 150 pages of it is machine-checkable proofs); the annotated version is something like 420. In news: My thesis defense has finally been scheduled, for Monday 21 January 2008 at 9:30am. (Yes, I know, but it's the only day of the week that could work for everybody, and it has to be early because my external member is teleconferencing from England.) I believe it is open to the public, and I promise to make it a worthwhile talk for 9:30. 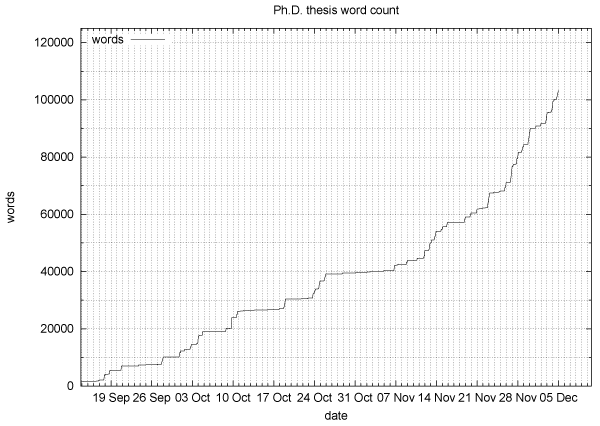 As another calibration, my dissertation is currently about 1/8500th the size of Wikipedia. Look at the ever increasing slope! Keep it up to the Singularity. Monday the 21st is also MLKJ day! It's a day on, not a day off! Who is your external member? I almost want to go see your defense though it would probably be over my head. Is it about security per se? Graue: No, in fact, one of the biggest open problems with my work is how to compile distributed programs securely when some of the hosts are controlled by attackers. Every distributed language has this problem, but in some ways it is exacerbated by higher-level language features. I think it is solvable (in fact there are some reasonable solutions out there); it's just not something I'm trying to do in my thesis. Rob: ML5/pgh+Server 5 are about 1/75th the size of the Linux kernel. I don't think it's an interesting comparison, though, because they're written in very different languages! Wow, I didn't know Peter was your external member. I know him. He was one of the lecturers at the Oregon summer school of which I speak so highly.